According to traditional science, matter may exist in three different basic states: solid, liquid, and gas. However, around the mid-1800s, several different scientists began to observe that at certain temperatures some substances seemed to behave unusually, appearing cloudy and in various colors, rather than obeying the usual optical properties displayed by any of the known states of matter. Over time, evidence accumulated by members of the scientific community, especially German physicist Otto Lehman and Austrian botanist Friedrich Reinitzer, resulted in the wide acceptance of the existence of a new phase of matter, which came to be known as the liquid crystal phase. As indicated by their name, liquid crystals are characterized by their partial similarity to both liquids and crystalline solids. More specifically, liquids are isotropic with no directional order and crystals have clearly defined directional order vectors that describe characteristics of the lattice structure. Liquid crystals exhibit order in only one or two directions, hence they are still able to flow like liquids but exhibit some order parameters like solids. Transitions to liquid crystal phases may be initiated by two different methods. The earliest of these to be discovered was thermal in nature, researchers discovering that by raising the temperature of certain solids or lowering the temperature of various liquids, a liquid crystalline state developed. Most known liquid crystals are produced by such means and are commonly termed thermotropic. Among the thermotropic liquid crystals there are two fundamental classes of substances, those that are enantiotropic, which are able to enter the liquid crystal state both by cooling a liquid and heating a solid, and those that are monotropic, which can enter the same state via one or the other of those methods, but not both. The other fundamental way that a substance may enter a liquid crystalline phase is by the action of a solvent. Liquid crystals that are produced via this method are described as lyotropic. The behavior exhibited by lyotropic liquid crystals is dependent on the concentration of molecules in solution. In addition to differentiation based upon their cause of formation, liquid crystals are generally classified according to their basic molecular organization. Three main types are widely recognized: smectic, nematic, and cholesteric. The molecules of smectic liquid crystals are organized into layers, which can easily slide over one another. The slipperiness of soap (the Greek word for which is smectos), which exhibits a type of a smectic phase, is indicative of the ease with which these layers shift about. Within the layers of a smectic liquid crystal, the molecules remain stable and are oriented so that their long axes are in a parallel position perpendicular to the plane of the layers. The molecules may also be ordered into patterns or positioned randomly depending on the substance in question. Nematic liquid crystals are similarly organized so that the axes of their molecules are oriented in a parallel fashion, however, they do not exhibit layering. 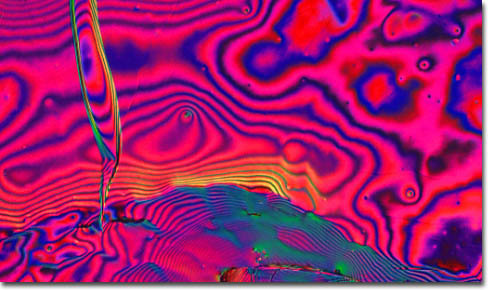 Cholesteric liquid crystals, on the other hand, are often considered to exhibit a modified nematic phase, the molecules they contain being parallel, but characterized by a continual rotation of the direction of molecular alignment. This unusual twisting often causes the appearance of bright colors when cholesteric liquid crystals diffract light. The best-known application of liquid crystals is the widely utilized liquid crystal display (LCD). Made practical in the 1960s by American scientist James Fergason, liquid crystal displays are based upon the interaction of liquid crystals with polarized light waves and an electric field. In its most basic form, the seven-segment LCD numerical display, which is widely used in watches, clocks, and similar items, this technology is simple to understand. Placed in the middle of two polarizers oriented at right angles with respect to each other, a cholesteric liquid crystal is sandwiched between two glass plates that feature seven individually chargeable electrodes. When no current is applied to the electrodes, light entering through the first polarizer undergoes a 90 degree twist as it passes through the cholesteric liquid crystal between the glass plates due to the inherent molecular rotation characteristic of this phase of matter, enabling the light to successfully pass through the second polarizer. This light can then form one of the seven segments on the display. When current is applied to the electrodes, however, the liquid crystal aligns with the current and loses the cholesteric spiral pattern, effectively causing the light to be blocked by the second polarizer it encounters. Thus, by coordinating the voltage on the seven positive and negative electrodes, the display is capable of rendering the numbers 0 through 9. In addition to the LCD, there are a number of other uses for liquid crystals and many more currently in development. For instance, the optical properties of cholesteric liquid crystals make them highly useful in a type of thermometer that changes color as temperature fluctuates. The familiar novelty known as the "mood ring" is based on the same liquid crystal sensor technology, which is being investigated for its potential use in the medical field for temperature mapping of the body. Intense liquid crystal research is also being carried on in the optical imaging and recording industries, and early promise suggests that in the upcoming years new liquid crystal-based technologies could make drastic changes in these fields. Already on the market are "smart windows" that use liquid crystals and an electric current to turn windows from clear to translucent with the flip of a switch, readily providing a certain amount of privacy without sacrificing all incoming light. Liquid crystals have also been utilized for holography, stress testing of materials, and the visualization of radio frequency waves, and will likely become even more important as the field of nanotechnology develops.